So sometime over the weekend, this blog ticked over 5 years of existence.Which means it's now as old in dog years as I am in human years. The blog itself has had some minor changes, like the template and an increase in acronyms. I too have had some changes, I'm 6-7kg heavier, and am dirty dirty roadie... and basically just a crit racer at that! I had a brief scan through the 186 odd posts I've got tagged as racing, and was pleased to see that I used to race b grade on road and track, and now am a fairly confident a grader. 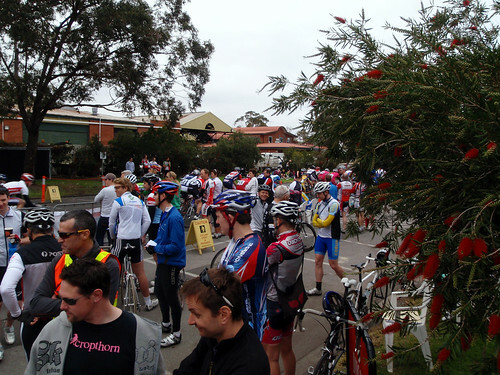 That said, it seems the first time I raced a grade was because I'd turned up to SKCC too late to enter B. A couple of weeks before that first a grade experience, I took this photo. In it you'll see Ian, resplendent in yellow arm warmers. What I found funny was that riiiiight on the left, carrying a coffee, is Dunny. I had no idea who he was back then. It's probably for the best, as it looks like he's wearing Tri shoes. Enough of differences, as there are a few things haven't changed in the last 5 years. For a start, riding with mates is still about the best thing ever, and farts are still funny.